We took time off in Glenn’s Ferry, Idaho to rest and wait for our Airstream appointment in Boise. Idaho does more for the over-62 set than most western states, which is to say, something. Idaho gives us half price on their state campgrounds Monday through Thursday, which puts this nice, roomy water and electric hookup camp into the affordable class at $16.32 per day. Louisiana is Sportsman’s Paradise, Texas is The Lone Star State, and based on the huge number of high volume agricultural/industrial watering systems, Idaho must be The Irrigation State. Three Island Crossing is as well-groomed and green as the fairway at Augusta National. Sitting on the grass was such a treat after those days on lava cinders. The Snake River runs right by the campground. It is very wide here, 200’ at the narrowest and 500’ at the widest. It looks lazy, but this ford was the most feared on the Oregon Trail. They used those three islands to break the swim (animals and the first guy) or the wagon boat trip (everything else) into more manageable chunks. We just used it as scenery. 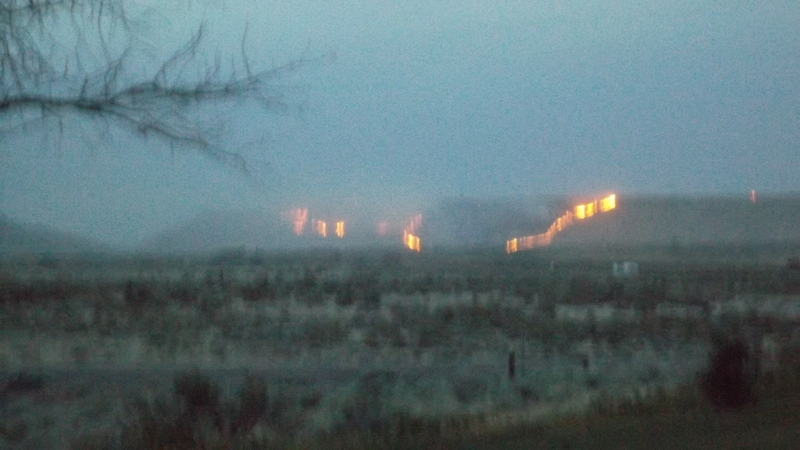 The hill was ablaze with no firefighters in sight, with those big winds blowing it right at our campground. It looked to be a mile or so away. Darkness makes fire more frightening, and fellow campers began to pack up and hastily pull out. Our Hensley hitch makes panic getaways inadvisable; we decided to wait it out. Then the power failed. I paid the Camp Host a visit for the official take on the fire, but it was his day off. I checked the truck’s compass, studied a map of the campground, and happily poured a tall wine to watch the fire. The Snake River lies completely between us and the flames! 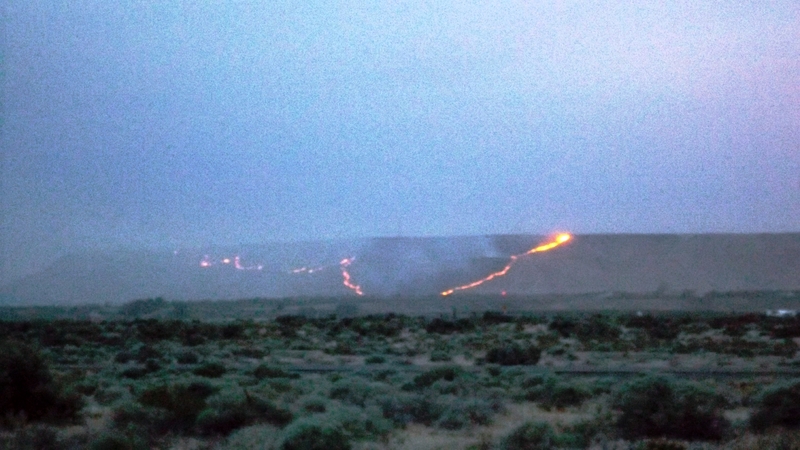 Fire crews appeared and fought it for a couple of hours, finishing up around midnight. Out west fire is as dangerous as bears. Again we caught a break. Whooo! 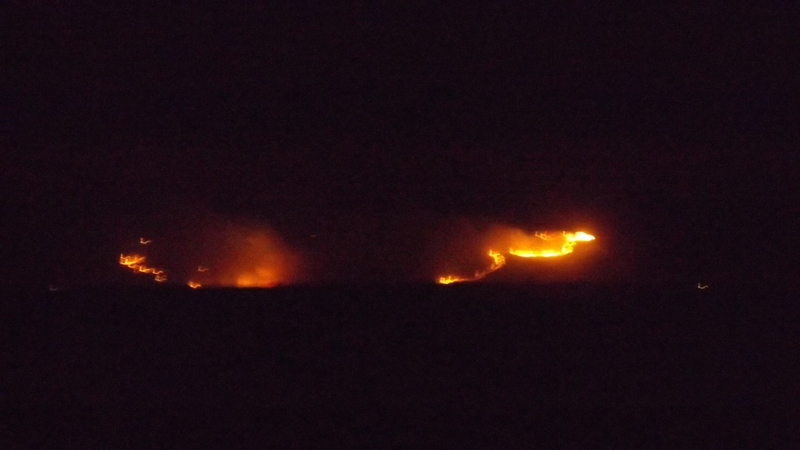 That fire looked close… exciting, probably too exciting! We saw the Colorado fires on the news here. They said it was the largest in state history – nothing feeds a fire like dry pine trees, Eeeek! love the blog and the photos! It was too exciting. When several other campers leave and the host is in absentia, staying up on fire guard duty seems the right thing to do. Then I realized it had to cross that big river to get us, felt better, and almost immediately the fire fighters put a breach in the line of flames, then went after it on all four ends. Midnight is late for an old guy to hit the sack.